The Victorian Football Association (VFA) had no finals system in place between 1877-1902, in the event of two teams finishing tied for first place (based on their win-loss record) they would contest a playoff match to determine the premiership. By modern standards where the season builds to a September frenzy, such an end to the season seems devoid of excitement but finals fever was a foreign concept in football's early years. It took the Collingwood-South Melbourne end-of-season playoff in 1896 to alert the game's administrators to the potential of such matches. One would think the likelihood of teams finishing equal in such an era, creating the need for a playoff, would have been high but it was actually the opposite. The system worked for the VFA due to the lack of standardisation across the competition. For much of the era clubs set their own fixtures, matches were played against numerous provincial and junior teams, and the number of games played each season varied greatly. 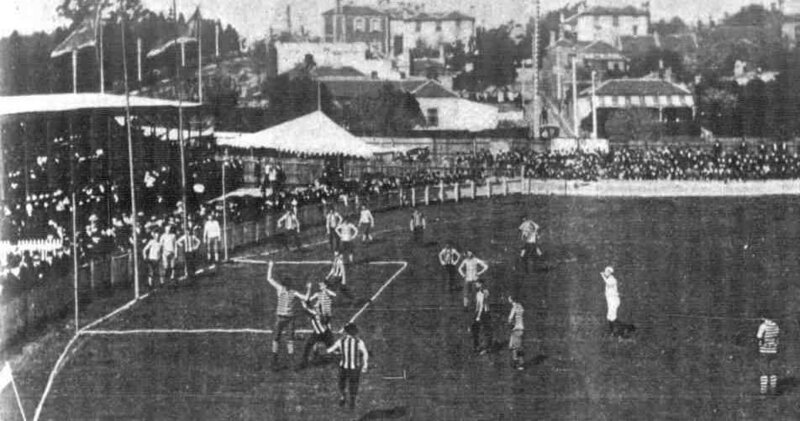 Even after the introduction in 1888 of an 18 game minimum to be in contention for the title, teams continued to play different numbers of games each season until centralised fixturing was introduced in 1894. There were two occasions when a playoff was required, along with some near misses that ultimately cost the Association in lost revenue. GEELONG - A WORTHY PREMIER? Geelong (15-1-0) clearly had the best win-loss record of all teams in the competition but there was some doubt over their claims to the title. They had only played three senior teams that year (Albert Park, Carlton, and Hotham) and the provincial teams they had defeated were not considered as strong as their metropolitan counterparts. 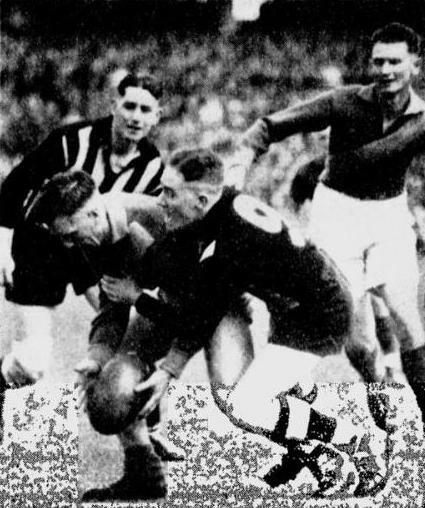 To settle the issue a premiership playoff was scheduled for October 5th between Geelong (the top provincial team) and Melbourne (the top metropolitan team). Based purely on their win-loss record in all matches that season, Carlton (17-1-6) should have been placed ahead of Melbourne (11-5-6). However, the dominance of these two teams during the previous decade meant the results of their head-to-head matches carried added significance. Thus, although Melbourne had an inferior win-loss record, their 4-0 record in matches against Carlton that season allowed them to claim the title of the best metropolitan team. The match itself aroused great interest with many spectators making the long journey from Geelong for the match. After an even first half the provincial team steadily went ahead to claim victory by 4 goals and their first VFA premiership. After their final matches of the season Collingwood and South Melbourne were deadlocked at the top of the ladder with identical win-loss records (which was the sole tie-breaker of the era); both clubs had 14 wins, 3 losses and a draw leaving them level on 58 points. Remarkably, both had conceded the same number of goals (55) with the only difference being the number of goals kicked for the season: Collingwood had scored 86 to South Melbourne's 85. With the teams unable to be separated, a playoff was needed to decide the premiership and the match was scheduled for the EMCG on September 27, the final day of the season. However, the weaker clubs feared their gate takings would be heavily reduced if the playoff was held the same day as their matches, and called for a meeting of delegates from all of the Association clubs. At the meeting held on September 22 they won a vote (11 to 8) to move the match to the next weekend, extending the season by a week. The two competing clubs remained dissatisfied and the following night a second meeting was held to finalise the matter, with the vote again in favour of playing a stand-alone match in a fortnight, the tally this time being 10 to 9. Administrators of Collingwood and South Melbourne strongly considered going ahead with the match regardless but these plans were abandoned because the VFA would not provide an umpire under such circumstances. Ironically, despite the postponement of the playoff, the final round of matches was poorly attended. Rather than protecting their position the weaker clubs had actually forced themselves into a corner; the two special meetings and the need for a vote had merely helped to inflame existing tensions and hardened the resolve of the stronger clubs. On October 2 - the day before the playoff match - Collingwood, South Melbourne, Essendon, Fitzroy, Geelong and Melbourne voted to break away from the VFA and form the VFL. These clubs were clearly the strongest in the VFA from a financial viewpoint and in addition to forming their own league they also invited Carlton (on the proviso they obtained a suitable home ground) and St Kilda to join them in their new competition. The method of deciding the premier team changed in 1885 from the team with the "best record" to the team with the "least number of losses". [VFA Tables - Season 1887] This nearly resulted in a playoff being required in 1887 when the VFA ruled that Geelong's match against Ballarat Imperial, played July 2nd, should count towards the premiership. Geelong had lost that match and its inclusion left them with a win-loss record of 16-2, with 3 draws. Had the match not counted they would have finished 16-1-3, leaving them tied for losses with Carlton (15-1, with 2 draws). The problem was removed the following year when a proportional points system was introduced to determine ladder position. Under a new fixturing system introduced that year, all teams played 15 matches and then the top four contested a round robin. At the end of 15 rounds Footscray (12-3) was placed first and Port Melbourne (9-6) were third. Port Melbourne launched a protest seeking to have two losses against North Melbourne earlier in the season overturned due to a permit issue. [North Melbourne Gazette, 2-9-1897] The round robin commenced on September 3rd without the matter being resolved. Week 1 of the round robin was played on September 3rd - Footscray (1st) defeated North Melbourne (2nd) and Port Melbourne (3rd) defeated Richmond (4th). This left the standings at: Footscray 13-3, North Melbourne 11-5, Port Melbourne 10-6, Richmond 8-8. Footscray, with what was seemingly an unassailable lead in the standings, were announced in the various newspapers that week as the 1898 VFA premiers. Week 2 was played on September 10th - Port Melbourne defeated Footscray and North Melbourne defeated Richmond. This left the standings at: Footscray 13-4, North Melbourne 12-5, Port Melbourne 11-6, Richmond 8-9. Footscray (1st) vs Richmond (4th) and North Melbourne (2nd) vs Port Melbourne (3rd). For reasons unknown these matches were never played; a remarkable decision when one considers that a Footscray loss to Richmond - however unlikely that may have been - and a North Melbourne victory would have left the top two teams tied on 13 wins and 5 losses. The Port Melbourne protest was heard on September 23rd and, if upheld, their win-loss record would have changed from 11-6 to 13-4, drawing them level with Footscray and forcing a playoff for the premiership. According to reports in The Argus [24-9-1898] the VFA initially seemed likely to rule in Port's favour but North Melbourne delegates successfully argued the protest was not valid because Port Melbourne had failed to follow the procedure of depositing three guineas with the Association for each point of protest. Port Melbourne's case was subsequently dismissed by a vote of 6 to 4 and Footscray were officially declared premiers. The events of the previous season were repeated in 1902 but this time the roles were reversed. Entering the final round Richmond and Port Melbourne were level with a 14-1 win-loss record; Richmond posted a comfortable win over lowly Prahran (8th) but Port Melbourne suffered a major upset, losing to Williamstown (4th) who entered the game with a 7-8 record. [The Argus 1-9-1902] The VFA and its clubs had been banking on a huge financial windfall from a premiership playoff the following week but Port Melbourne's defeat put an end to these plans. The loss was a significant factor in the Association finally introducing a finals series the following season. The VFA was faced with an important decision after the 1902 season: maintain the status quo or introduce a finals system? Having watched an annual finals series generate extra income for their VFL rivals since 1897, and missing out on their own financial windfall in 1901-02 due to upset losses that cancelled the need for a premiership playoff, the decision to introduce their own final series was a relatively easy one. The new system crowned a minor premier (the leading team after the home-and-away rounds) and comprised two semi-finals (2nd vs 4th and 1st vs 3rd) followed by a final between the winner of each semi-final. If the minor premier won their semi-final and final, they claimed the premiership. However, if they lost at the semi-final or final stage they had the right to play a challenge final the following week. The challenge final was an early form of the "double chance" used in later systems and ensured the top team always played-off for the title. Richmond, Footscray and North Melbourne - three clubs that would later move to the VFL - dominated this era. At least one of these teams played in 17 of the 20 Grand Finals contested, winning 13 of them. The only Grand Finals to involve teams other than the "big three" were: 1907 - Williamstown def. West Melbourne, 1909 - Brunswick def. Prahran, 1911 - Essendon A. def. Brunswick. 1903 - North Melbourne won their first VFA premiership. Sept.14 - Umpire Allen was appointed for the final match and the Richmond delegate present at the meeting lodged no objection. Sept.15-16 - Allen received a sarcastic letter from the Richmond secretary, the letter was accompanied by a rule book. Sept.17 - Allen submitted the letter to an Association meeting. Sept. 20 - the Association received a complaint from Richmond about Umpire Allen not performing the boot inspection. The letter was dated the day before Allen had been appointed for the Challenge Final. The VFA was determined to penalise Richmond but received the reply "Do your worst, we merely did not exercise our right of challenge". Richmond went unpunished but by the next season the Association had altered the rules: instead of a minor premiership, with a voluntary right to challenge, it became mandatory for the team leading at the end of the home-and-away rounds to play again if beaten in the semi final or final. A marking contest during the 1906 Grand Final at the EMCG - West Melbourne defeated Footscray to claim their only VFA premiership. 1906 - West Melbourne won their first - and only - VFA premiership (see the photo above). 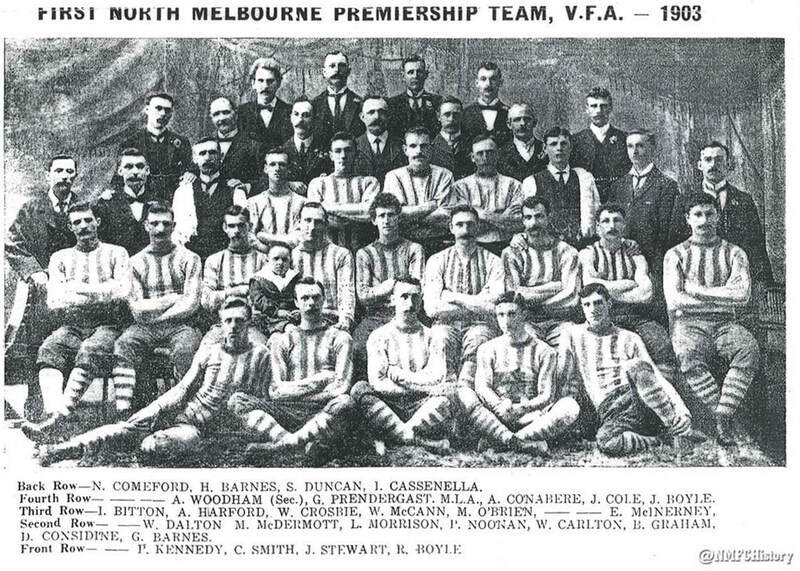 1907 - Williamstown won their first VFA premiership. 1909 - Brunswick won their first VFA premiership, and Jack Johnson served as acting captain due to 'Dookie' McKenzie's injury in the previous match. 1911 - Essendon 'A' won their first VFA premiership. 1912 - Essendon 'A' won back-to-back titles and took ownership of the new premiership trophy first awarded in 1910. 1913 - Footscray qualified for the finals in first place, half a game clear of North Melbourne. The Bulldogs went on to win the premiership but had to work for it, winning their semi final by just 2 points then scraping home by a point in the Grand Final. 1914 - North Melbourne won the first of three successive premierships. 1915 - North Melbourne went through the season undefeated, the first team to achieve this feat since Essendon in 1893. 1918 - North Melbourne again went through the season undefeated. The Grand Final was a massacre with North leading by 6 goals to none at quarter-time and 11 goals to one at half-time. When the final bell rang they had won by 93 points; a huge margin in an era when big scores and wins were the exception rather than the norm. The winning margin eclipsed the old record of 48 points (also set by North in 1915) and remained a VFA Grand Final record until Port Melbourne's 100 point victory in 1977. Adding to the day of records, North's Tom Stevens kicked 9 goals, the most in a Grand Final until 1927 when Coburg's Paddy Gardiner kicked 10 goals in the decider. 1919 - North Melbourne entered the finals undefeated and on a 58-match winning streak that started in 1914, but in a huge upset they lost both finals. 1920 - Footscray won the title after surviving a second semi-final that took three weeks to complete. The match was originally scheduled for September 18th but was postponed a week due to torrential rain. The match on September 25th had to be replayed: Footscray led by 5 points when Considine, a North Melbourne player, marked 30 yards out from goal a split second before the final bell. The crowd believed the game had ended and flooded the field, making it impossible for Considine to take his shot at goal. The VFA ruled the match unfinished and ordered a replay. On October 2nd Footscray won the replay by 4 points and then claimed the title with a 3 point win in the Grand Final. 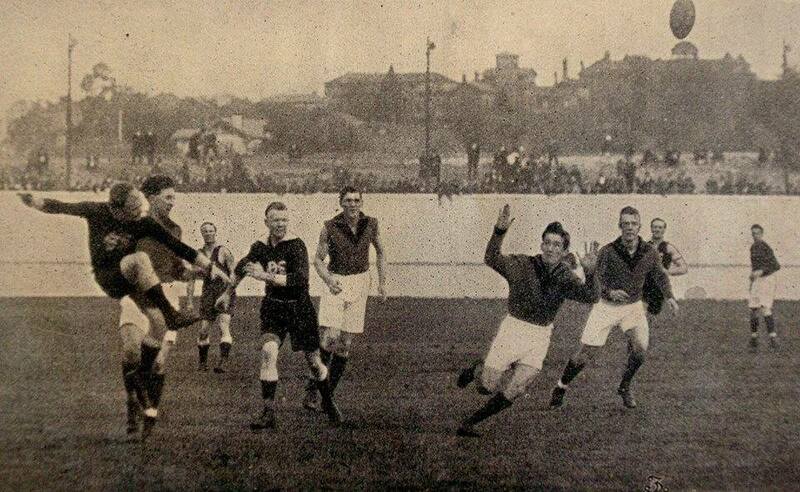 1921 - The Grand Final was scheduled for October 15th at the EMCG (the last game to ever be played at the venue). However, the Preliminary Final on October 8th was abandoned during the third quarter due to a freak hailstorm and had to be replayed on the 15th, pushing the Grand Final back to the 22nd. The Victorian Railway authority were scheduled to begin demolishing the stadium on the 16th and refused to postpone the project by a week. This forced the VFA to find an alternative venue for the decider; a task made more difficult because most grounds had been top-dressed for cricket season. The match was eventually played at the Brunswick Street Oval, home ground of the Fitzroy VFL team. 1922 - Four players from Port Melbourne, including captain Gus Dobrigh, advised the club they had been offered large sums of money to "play dead" in the final. [The Argus 25-9-1922] The four players rejected the offer and were part of the premiership team that overcame Footscray by 2 points. A subsequent VFA investigation charged three people with attempted bribery: George Sayer (Footscray's President), Matthew O'Donoghue (a member of the Footscray team who was alleged to have made his offer on-field during the Grand Final), and Vern Barnbury (a former Footscray player). 1924 - Footscray won their second consecutive title. Two weeks later they played an exhibition match at the MCG against Essendon, the VFL premiers. A good performance in this match was crucial for Footscray, who were one of the teams the VFL was targeting for their expanded competition in 1925. To the surprise of many, Footscray cruised to a 28 point victory that paved the way for their move to the rival competition the following season. This era was one of tremendous highs and lows for the VFA, ranging from a grounds dispute in the 1930s that saw the majority of clubs threatened with eviction through to the record crowds of the late 1930s and 1940s. For Coburg, Northcote and Williamstown this era would prove to be their most successful period in the VFA, however, for Port Melbourne it will forever be remembered as an era of missed opportunity. Coburg were a well-established junior club when they entered the VFA in 1925 and wasted no time asserting themselves at the top level, making the finals in their first season. This achievement was followed by three successive titles in 1926-27-28. The club then lost three straight grand finals in 1932-33-34 and wouldn't claim another senior premiership until winning the 1970 Second Division title. Northcote departed the VFA in 1987 with five top-level premierships to their name, all of which were won during this era. Between 1929 and 1936 the club contested no less than 7 of the 8 Grand Finals held, winning five of them. Remarkably, the club's only other grand final appearances after that came in 1961 and 1982 at Second Division level. Williamstown dominated the 1950s, playing in six of the eight grand finals held between 1954 and 1961, winning five of them including three successive titles in 1954-55-56. The club went on to claim Second Division titles in 1970 and 1976 but would not win another top-level premiership until 1986. Port Melbourne experienced some success during this period, the highlight being back-to-back flags in 1940-41. However, in the 1950s the club set an unwanted record that may never be matched in top level Australian football; the Boroughs played in 8 straight VFA grand finals from 1950 to 1957 but were only able to win one of them, a 21 point victory in 1953. 1925 - The Grand Final was originally scheduled for August 22nd but was postponed a week due to torrential rain. 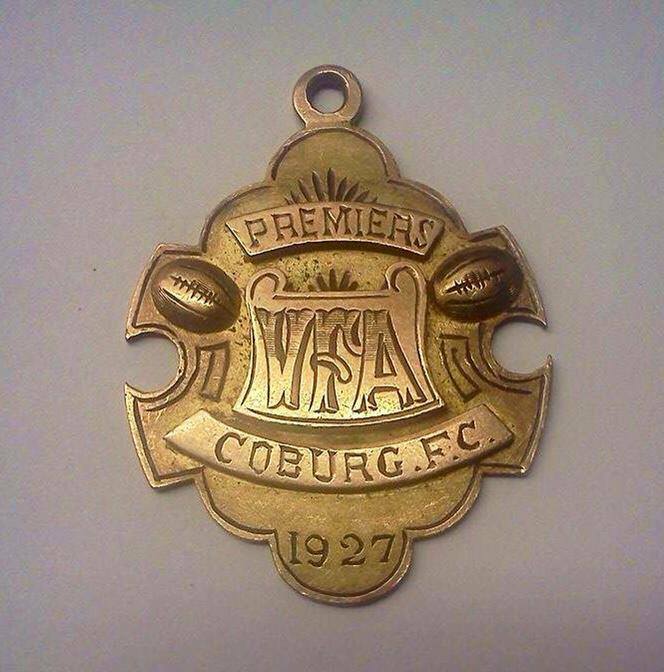 1926 - Coburg won their first VFA premiership, the first of three successive titles. 1927 - Coburg full-forward Paddy Gardiner won the game (and the shootout), finishing the Grand Final with 10 goals. Brighton's Jim Walsh kicked 7 goals for the losing team. 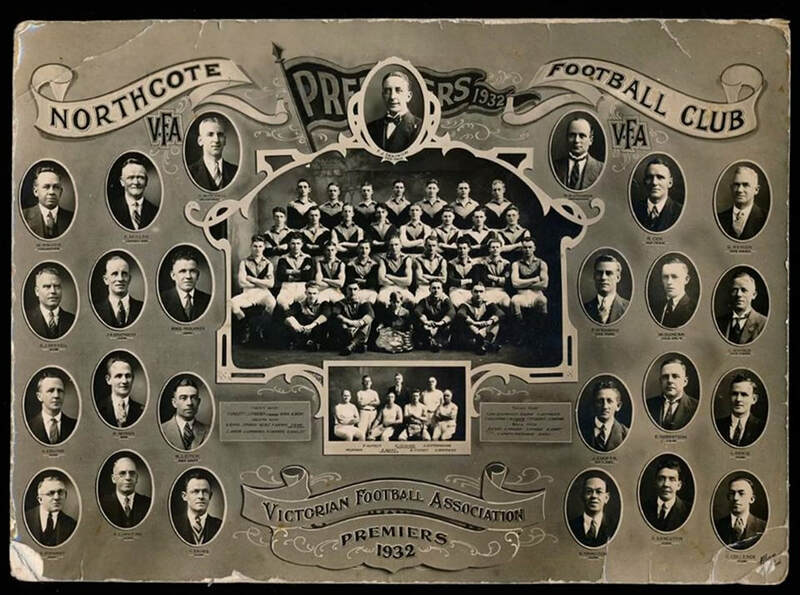 1929 - Northcote won their first VFA premiership. 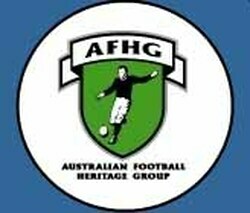 1930 - Oakleigh won their first VFA premiership, achieved in just their second season in the Association. 1931 - Oakleigh won their second straight premiership; the year before they had defeated Northcote by 9 points in a hard-fought battle but the 1931 game was even tougher, again defeating Northcote but this time by just 3 points. 1932 - Northcote won the first of three successive premierships. Full-forward Frank Seymour kicked 8 goals for the winners. 1934 - The Grand Final was originally scheduled for September 29th at Olympic Park but torrential rain persisted throughout the week prior and continued on game day. Despite the match being heavily promoted, the VFA decided on the morning of the match to postpone the grand final until the following weekend. It later emerged that Olympic Park was unavailable the following Saturday afternoon, leaving the Association scrambling to find another venue. All of the VFA suburban grounds were unavailable having been top-dressed in preparation for the cricket season. The VFA asked permission to play their Grand Final at the MCG as a curtain-raiser to the VFL Preliminary Final but the League Seconds refused to play at another venue. The option of playing the game on Saturday night at Olympic Park was investigated but there were doubts over the suitability of the new floodlights at the venue. The Association decided not to use their showcase match as an experiment for night football and another venue was sought. The only suitable venue that remained was the arena at the Royal Melbourne Showgrounds and the match was played there on October 6th in weather conditions similar to the previous Saturday and in front of only 2,300 spectators - around 8,000 less than the crowd expected the week before. 1935 - Yarraville defeated Camberwell to win their first VFA premiership. Almost three weeks later the same teams played an exhibition match under lights at Olympic Park on the Show Day holiday. A crowd of 3,000 watched Yarraville win the "re-match" by 19 points - exactly the same margin as the Grand Final. 1937 - Prahran won their first VFA premiership; after trailing all day they took the lead late in the match to triumph by 2 points. 1938 - The week before the 1938 Grand Final the VFA's Match Arrangements Committee chose Brunswick's home ground for the match; this was despite Brunswick being one of the competing teams. The decision was later overturned after Brighton protested to the Association and the match was held at Toorak Park, home of the Grand Final since 1935. From 1930 to 1937 the average crowd for a VFA Grand Final was only 9,500 people. For the 1938 match an unexpectedly large crowd - estimated at somewhere between 17,000 to 20,000 spectators - were wedged into Toorak Park. In the weeks after the game the Association lobbied the local council to expand the capacity of Toorak Park but their pleas were rejected. 1939 - The VFA had introduced a number of new rules in 1938 - including the throw pass - that created a faster, alternative version of Australian football to that being played by the VFL and other leagues. Increased attendances throughout the season, combined with the unexpectedly large turnout at the 1938 Grand Final, made it clear that Toorak Park was no longer sufficient for the premiership decider and in 1939 the VFA made one of their wisest decisions, transferring their Grand Final to the MCG, a week after the VFL held their decider at the same venue. The match itself featured 4th-placed Williamstown coming back from 22 points down at half-time to win by 9 points, an incredible achievement considering they had finished last the previous season. 1940 - Ted Freyer set the VFA record for most goals in a Grand Final, kicking 12 goals for Port Melbourne. At the other end of the ground, Prahran's Roy Lyons kicked 9 goals for the losing team. 1945 - Ron Todd of Williamstown kicked 6 goals to reach a total of 188 for the season - this established a new Australian record at the top-level, surpassing Bob Pratt's record of 183 goals in 1941 while playing for Coburg. 1948 - Brighton's first - and only - VFA premiership. 1949 - Williamstown entered the match as minor premiers but trailed at half-time by 25 points. They rallied in the third term and by three-quarter time had cut the deficit to just 3 points; eventually surviving a fierce final quarter to claim the title by the same margin. 1950 - Port Melbourne played the first of 8 successive Grand Finals; their only victory was the 1953 decider. 1954 - Williamstown won the first of three straight premierships. 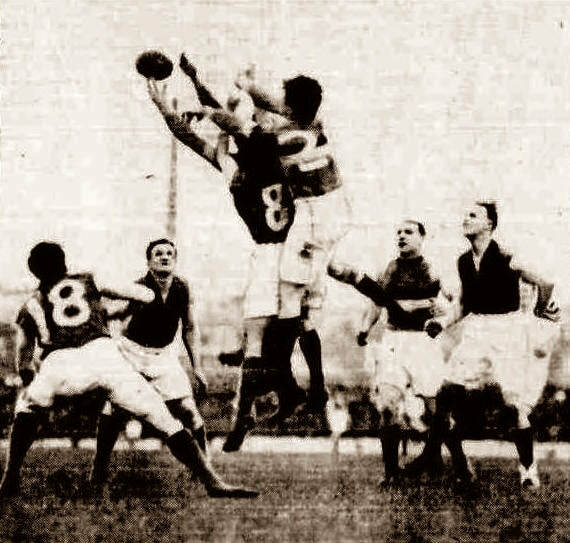 1955 - Aided by the breeze, Port Melbourne led by 43 points during the second quarter and were still 31 points in front late in the third quarter, but were overrun by Williamstown in the final quarter to lose by 9 points. 1957 - Moorabbin's first VFA premiership. 1958 - Williamstown and Moorabbin, the top two sides of 1958, played the VFA's only drawn Grand Final. Moorabbin went ahead early to lead by 28 points at quarter-time but Williamstown rallied and the match remained close throughout the second half. Williamstown dominated the replay the next week; leading by 64 points at three-quarter time and eventually recording a 32 point win. 1959 - Williamstown played in their sixth Grand Final in seven seasons, they won 5 flags during this period. By 1960 the VFA had expanded to 17 teams and changes were required. The competition was split into two divisions for the 1961 season: a First Division comprising the top ten teams of 1960, and a Second Division comprising the bottom seven teams of 1960 plus a new club (Waverley). This system ran from 1961 to 1988 and each division played their grand final at a separate venue: usually Junction Oval, St Kilda for the top division and Toorak Park, Prahran for the lower division. The format remained unchanged until 1985 when the Second Division Grand Final became the curtain-raiser for the First Division's premiership decider. 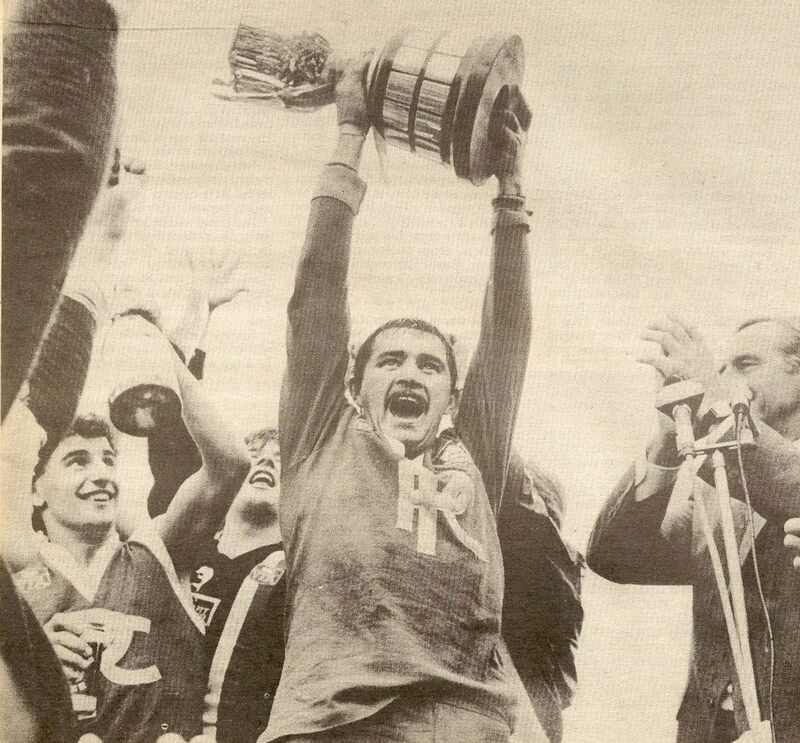 The era is notable for Port Melbourne's record run of 11 straight seasons in the finals (1973-1983); Dandenong's rise to First Division and bitter rivalry with Port Melbourne; Geelong West's undefeated 1972 season in Second Division, followed by the 1975 premiership at the top level; big crowds at the Junction Oval throughout the 1970s, and the demise of many long-standing clubs throughout the late 1980s. By 1995 the VFA was at the point of collapse and just nine teams contested the Association's final season. That year the competition came under the control of the VSFL (known today as Football Victoria) and in 1996 the VFA was renamed the Victorian Football League (VFL). NOTE - only First Division Grand Finals (1961-88) are shown below - full details of Second Division Grand Finals can be found here. 1961 - Yarraville broke through for their second VFA premiership (their first was in 1935). 1962 - Sandringham's great escape; the Zebras were only 9 points behind at half-time but a scoreless third quarter left them trailing by 44 points at the final break. Remarkably, they scored 8.3 in the last quarter to Moorabbin's solitary goal to steal the match by a point. 1963 - Moorabbin gained their revenge in the re-match of the 1962 Grand Final, defeating Sandringham by 64 points. The crowd was the lowest at a VFA Grand Final since 1937 due to the VFL playing their final match the same day. In the months following their premiership victory, Moorabbin was accused by the VFA of approaching VFL teams Richmond and Fitzroy during the 1963 season with a merger proposal. On October 29th the VFA held a hearing into the accusations and recommended that the club be expelled for acting against the interests of the Association. The club held an extraordinary meeting on March 25th, and determined that its official position was to support the council in their efforts to attract League football to the district, and to seek a merger with the St Kilda Football Club. [The Sun News-Pictorial 26-3-1964] On April 3rd, the VFA Board of Management again discussed the expulsion of Moorabbin for "an act prejudicial to the VFA in supporting League football". A vote was held and Moorabbin was suspended from the Association indefinitely by a vote of 30 to 12, with their position to be reviewed after the 1964 season. 1965 - Waverley won their sole VFA premiership. It was the club's fifth season in the competition and they had only been promoted from Second Division in 1964 due to Moorabbin's expulsion. Moments later Port's captain-coach Brian Buckley ordered his players from the field in protest at the umpire's performance; half the Port Melbourne team had already assembled on the boundary line when Umpire Jackson attempted to restart play. Club officials led by Norm Goss Senior quickly intervened and ordered the players to return to the field and the match continued without further incident. This was the closest the VFA had come to a forfeit since Richmond refused to contest the 1904 Grand Final. 1971 - Dandenong won the 1971 Grand Final, one of the most controversial games in VFA history, but the result was not declared official until three days later. Before the first bounce, and prior to the siren sounding to start the game, Umpire McMaster noticed Dandenong's Jim "Frosty" Miller and Preston full-back Barry Leslie jostling in the goal square. Rather than bounce the ball to start play, he chose to award Miller a free kick from which the Dandenong full-forward scored the opening goal. The umpire then returned to the centre, the ball was bounced and the match commenced. The game ended with Dandenong leading by 6 points and Preston officials lodged a formal protest the following morning. They argued the free kick paid to Miller was illegal because the match had not formally started, thus the goal he kicked did not count and the match should be declared a draw at 92 points each, with a replay to be held the following weekend. 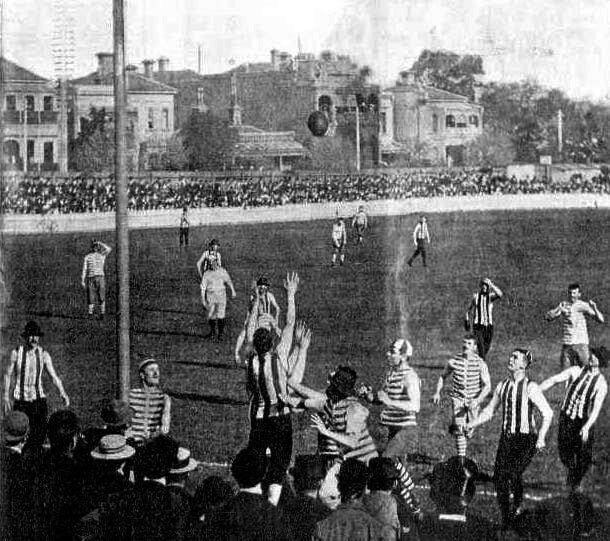 Dandenong reacted angrily to the protest because moments before the end of the match one of their players, David Sheehan, had taken a mark around 25 metres from goal, directly in front, and would have almost certainly scored from that position on the ground had he taken a shot at goal. The VFA Board of Management met three days after the game to hear the protest and one of the technicalities considered was Rule 6b which stated for play to commence: "The field umpire shall blow his whistle and bounce the ball in the circle... at the start of each quarter." After discussions lasting two and a half hours, the Board of Management dismissed the protest by a margin of 39 votes to 5 and Dandenong were finally declared winners of the 1971 premiership. 1972 - Former Melbourne Demons champion, Bob Johnson captain-coached Oakleigh to the premiership. Jim "Frosty" Miller kicked 9 goals for the runners-up, Dandenong. 1974 - Port Melbourne's Fred Cook kicked 10 goals and Port claimed their first flag since 1966. 1975 - Geelong West won their only top-level VFA premiership. The title came just three years after their undefeated season in Second Division. 1977 - Port Melbourne's 100 point massacre of Sandringham set a new record winning margin in a VFA Grand Final (the old record of 93 points had been set by North Melbourne in 1918). Fred Cook kicked 9 goals for the winners. 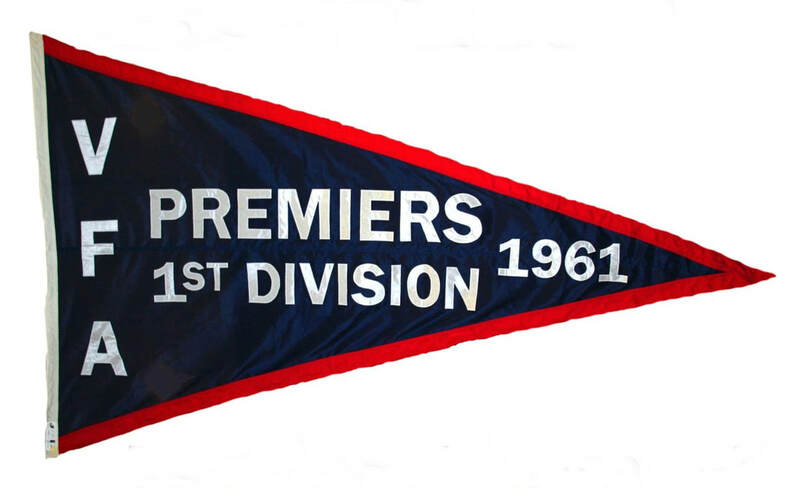 1979 - Coburg won their first top-level premiership since 1928 (they had also won Second Division premierships in 1970 and 1974). 1980 - Port Melbourne were behind at each break and 17 points behind at three-quarter time but overran Coburg to win by 11 points. 1981 - Port Melbourne's Fred Cook kicked 8 goals as the Borough set a new record winning margin in a VFA Grand Final. They had jumped out to an early lead of 29 points at quarter-time but a seven goal second quarter by Preston cut the margin to just 5 points at half-time. Port exploded in the second half, piling on 23.10 to Preston's 6.4 to record a famous 113-point victory. 1982 - Port Melbourne's third straight title. They led by 17 points at three-quarter time. The final term was a shootout with Preston outscoring Port 8.5 to 7.1 but Port withstood the challenge to win by 7 points. 1983 - After coming close in 1978, '81 and '82, Preston finally broke through with a 7 point victory over Geelong West. Preston's Geoff Austen won the inaugural Norm Goss Memorial Medal awarded to the best in ground in the Grand Final. 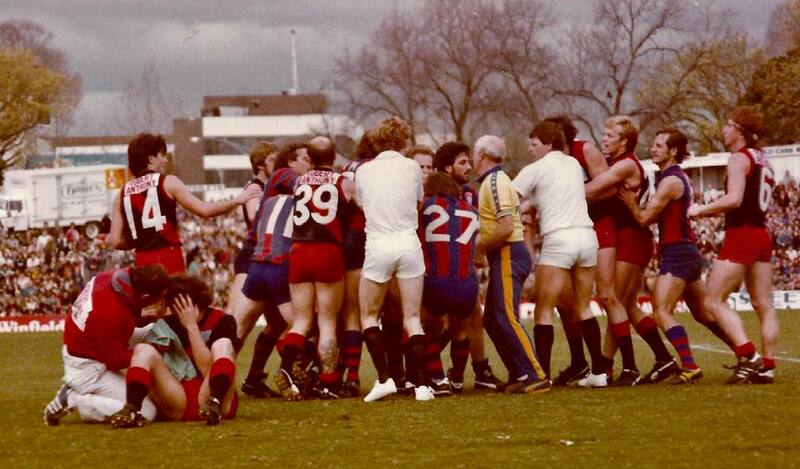 1984 - Preston claimed back-to-back flags with a 54 point victory over Frankston. 1985 - Sandringham held-on for a 6 point victory; their first premiership since 1962. 1986 - Williamstown won their first top-level premiership since 1959 (they had also won Second Division premierships in 1969 and 1976). 1987 - Springvale claimed their first VFA top-level premiership. The win came in only their sixth VFA season after entering the competition via Second Division. 1989 - Coburg won their second straight premiership. 1990 - Williamstown, after losing the 1988 and 1989 grand finals, trailed by 34 points early in the final quarter of the 1990 decider. However, a rush of goals transformed a seemingly comfortable Springvale victory into one of the most famous finishes in VFA Grand Final history. Inside the final minute veteran Billy Swan took a chest mark and went back for a set shot from 50 metres, a distance that seemed well out of range for a player never noted for his long kicking. Swan's drop punt was an ugly, floating kick but it sailed over the line to give the Seagulls a 2 point lead which they held to the end. 1991 - Dandenong claimed their first VFA premiership since 1971. It would also be their last title; three seasons later the club left the VFA and folded. 1992 - Sandringham's rookie coach, Trevor Barker finally enjoyed premiership success after years of playing in St Kilda's VFL cellar-dwellar teams of the 1980s. Led by Barker, the Zebras cruised to a 44-point victory over their highly-fancied rivals, Williamstown who were playing in their fourth Grand Final in five seasons. 1993 - Werribee broke through for their first VFA-VFL premiership, leading by 3 points at quarter-time before powering away to win by 42 points. 1994 - Sandringham were jumped early by Box Hill and spent the rest of the match fighting their way back. They trailed by 18 points at quarter-time, 21 points at half-time and 24 points at three-quarter time. Remarkably, they kicked 6.3 to 1.0 in the final quarter to steal a famous 9-point victory. Having won two flags in his first three seasons, Sandringham's coach Trevor Barker announced after the 1994 premiership win that he would be returning to St Kilda to coach their Reserves side. However, Barker had to stand-down halfway through the 1995 season after being diagnosed with colon cancer. Tragically, he passed away in April 1996 at just 39 years of age. In 1995 the VFA competition came under the control of the VSFL (known today as Football Victoria) and in 1996 the transition was completed when the VFA was controversially renamed the Victorian Football League (VFL). Despite the re-naming of the Association and numerous changes at the administrative level, on-field the competition remained largely the same with the nine surviving clubs of 1995 joined by North Ballarat and Traralgon in what was planned to be a new statewide league. The only on-field change between 1996-1999 was the departure of Traralgon after the 1997 season, and the addition of Bendigo as their replacement in 1998. The number of teams remained constant at eleven, and Springvale and Sandringham - the same teams that had played the last VFA Grand Final in 1995 - continued to control the competition with Springvale winning the premiership in 1996, 98, 99 and Sandringham claiming the 1997 flag. Whilst the VFA may have been renamed the VFL in 1996, it was not until the 2000 season that the VFA became the new State League that we are familiar with today. Following the 1999 season the Australian Football League (AFL) ended their Reserves competition, a decision that left the reserves teams of the Melbourne-based clubs searching for a new home. Six AFL clubs (Carlton, Collingwood, Essendon, Geelong, Richmond, and St Kilda) fielded stand-alone teams in the new VFL competition and a new club named the Murray Kangaroos was also added, increasing the VFA-VFL from the 11 teams that had competed since 1996 to 18 teams for the 2000 season. Port Melbourne were the first stand-alone club to win the premiership in the new league; their triumph is even more remarkable when one considers they went through the 2011 season undefeated with a 21-0 record (the first undefeated team in the VFA-VFL since Geelong West in 1972 [Second division] and North Melbourne in 1918). 1996 - The competition was re-named the VFL but on-field it was largely a case of "business as usual". Frankston entered the Grand Final as favourites to claim their first top-level VFA-VFL premiership but it was Springvale, courtesy of a Graeme Yeats goal inside the final minute, that claimed victory by 3 points. The win was their second straight premiership. 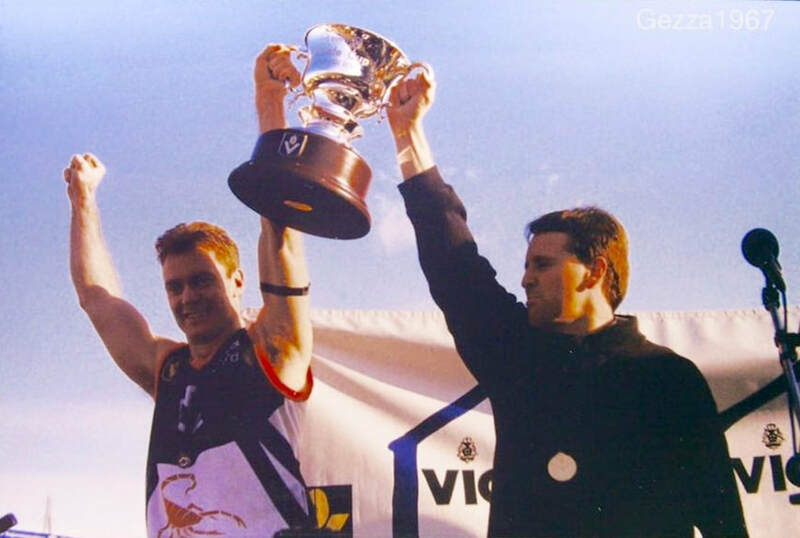 1999 - Springvale won back-to-back flags; the victory gave them 4 premierships in five years. 2000 - Sandringham comfortably defeated North Ballarat at Waverley Park; the only VFA-VFL Grand Final played at the venue. It was also the final match played there before the stadium was demolished and reconfigured into a training base for the Hawthorn Football Club. 2002 - Geelong's Reserves side won their first VFA-VFL premiership. The team included several young players that would later form the nucleus of their AFL premiership winning sides, including Gary Ablett junior, Paul Chapman, Jimmy Bartel, Steve Johnson, James Kelly and Josh Hunt. 2004 - Sandringham won the first of three successive premierships. They entered the final term with a narrow lead of 16 points and survived a Port Melbourne challenge to win by 4 points. 2007 - Geelong's Reserves side won their second VFA-VFL premiership. A week later their AFL affiliate won the AFL Grand Final; making Geelong the first club to win an AFL and VFL premiership double. 2008 - North Ballarat won the first VFA-VFL Grand Final to be played at night. This was also the first of three successive premierships won by the Roosters. 2011 - Port Melbourne became the first stand-alone VFA-VFL club to win a premiership in this era. Their Grand Final victory gave them a 21-0 record for the season and made them the first team to complete a perfect season since Geelong West in 1972 (Second division) and North Melbourne in 1918. 2013 - Box Hill and their AFL affiliate Hawthorn won the second AFL and VFL premiership double (Geelong in 2007 were the first to achieve this feat). 2014 - Footscray Bulldogs, the reserves team for the AFL's Western Bulldogs, won the premiership in their first year in the VFA-VFL competition. 2015 - Williamstown became just the second stand-alone VFA-VFL club to win a premiership in this era, storming away from Box Hill to win their first premiership in 12 years. 2016 - The Bulldogs became the first team to win the premiership from 4th position since Williamstown in 1990 and won their second flag in just three seasons in the competition. Their AFL affiliate, the Western Bulldogs, won the AFL premiership the following week; joining Geelong (2007) and Hawthorn/Box Hill (2013) as the only clubs to achieve an AFL and VFL premiership double. 2017 - Port Melbourne became the third stand-alone winners of the VFA-VFL premiership in this era. The Borough started the season asking for donations to avoid folding and finished the season as unlikely premiers. The Grand Final was an arm-wrestle throughout with Richmond leading narrowly at each break and up by 13 points twenty minutes into the final quarter. Port then kicked the final three goals of the match to seize a five-point lead and spent the last four minutes of the match trying to hang on. In one last twist, Richmond's Ben Lennon marked fifty metres out just before the final siren but his shot after the siren sailed right and Port claimed the flag by four points. 2018 - Box Hill should have been eliminated in their first final but a goal in the last second tied the match. They then overran a stunned Port Melbourne to win the VFA-VFL's first-ever final decided by extra time. A relatively easy 25-point semi-final win against Geelong was followed by another miraculous escape in the preliminary final; Box Hill winning by a point after a Williamstown shot at goal with the last kick of the game missed by inches. *Prior to 2018, six teams had won the premiership from fourth-place: Northcote (1936), Prahran (1937), Williamstown (1939), Prahran (1973), Williamstown (1990), and the Footscray Bulldogs (2016). NOTE - No teams in Second Division (1961-88) ever won from fourth place but six teams won the premiership from third: Geelong West (1964), Prahran (1966), Williamstown (1969 & 1976), Springvale (1983), and Prahran (1987).